2017 Hero 7: Dr. Hilaria Bauer – District 5 United! 2017 Hero Story 7 – Dr. Hilaria Bauer: The following story was submitted by community member Ray Mueller. Use the social media icons on this page to share this hero story or leave a comment at the bottom of this page. You may also share this story using Twitter hashtag: #district5united or short link http://bit.ly/2xrkFSy. 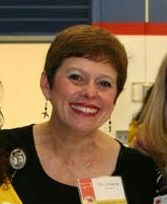 According to Ray: Dr. Hilaria Bauer has been a blessing for the Alum Rock Union School District for years. Her passion is evident in every interaction. Since her early days as Principal of Fisher Middle School to her time helping plan and implement curriculum for the district, to now when she works late daily, and gives of her weekends regularly she gives selflessly to serve our children. As the chief administrator, she elicits the counsel of all strata of her stakeholders. The children, parents, guardians, staff, and district neighbors are equally heard and respected unequivocally. The district has seen a renaissance, with more effort to engage the students in STEAM based learning and the parents in a community where they are not just needed but valued. She has brought our outreach into the digital world and is inspiring parents too In my role on the Citizens Advisory Committee, I have witnessed the office of superintendent take on a respected role among all those involved. Through the last few months, she has continued to maintain her professional demeanor even faced with some very unprofessional situations and characters. Through inspiration and leadership she has created something around which this diverse and frequently splintered community has chosen to knit itself, Rising above the distraction and hostility that our district recently suffered, her staff has also managed to help coordinate partnerships that will provide a better place for our children. Verizon will be providing funds for two of our middle schools to have 1:1 iPads. The Santa Clara County Board of Supervisors has approved a 3 year deal for $1M to provide counseling to help our kids in their schools. All of these things are what we should expect of the person in her role but not what we have been provided in recent history. The reason I want to nominate her as a D5 Hero is that she will never admit her role in any success. She will insist that every single success is due to someone else, and any chance for improvement falls directly on her. Her modesty should not deny her the accolades and appreciation of our community.